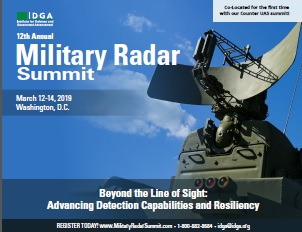 Securing Domain Awareness with Innovative Radar from Emerging Ground, Air and Maritime Threats From cutting edge research, to current customer needs and activities, Military Radar delivers a one-of-a-kind learning and networking experience. 1. Better Understanding on military and government needs and processes for acquisition, in order to secure the bid. 2. Discover New Emerging Technologies and innovative Strategies, improving interoperability and radar capabilities to enhance operation efficiencies. 3. Test New Technologies during our Demo Drive, evaluate and analyze new technology to advance operations. 4. Dive into Policy and Requirements, learn about compliance requirements for next generation radar technology. 5. 10+ Hours of Networking with military experts eager to discuss new challenges & new solutions. Get an inside perspective in order to be the best solution provider in the radar community. Download today, or if you would like just email us and we will send it right over to you.